The annual Christmas at the End of the Road fireworks show lights up the sky above the Winthrop Emporium. In the Methow Valley, it wouldn’t be Thanksgiving without Christmas — that is, Winthrop’s annual seasonal kickoff, Christmas at the End of the Road. With just a few changes, the two-day celebration will once again offer a downtown-centric variety of family-friendly activities. Walking will get you to any of them, but there’s also the option of a horse-drawn carriage. 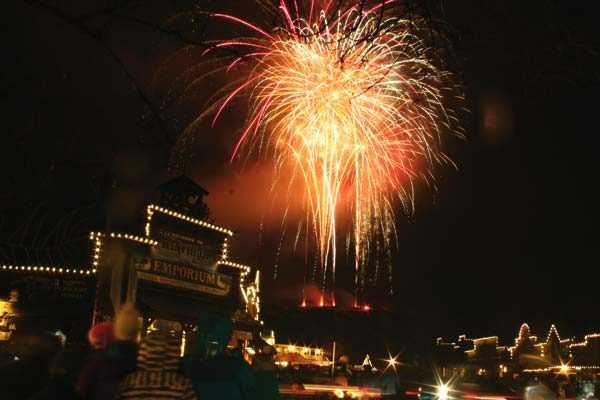 With the turkey dinner leftovers barely put away, Christmas at the End of the Road action starts on Friday (Nov. 23) and concludes Saturday night (Nov. 24) with the eagerly anticipated fireworks show, which organizer Doug Mohre aims to improve on every year — and that’s saying something. Granny Winthrop get things rolling when she reads children’s holiday stories at the Trail’s End Bookstore from 2-4 p.m. on Friday. There won’t be a hot air balloon lighting this year — instead, head over to the Winthrop Rink from 6-8 p.m. to skate with Santa. The rink’s usual fees apply. Saturday is a full day, which includes plenty of time for strolling the boardwalks and getting in some early shopping. Some stores will have extended business hours. Participate in the raffle at downtown Winthrop businesses and win prizes, organized by Trail’s End Bookstore. Work off some calories by taking part in the End of the Road 5-kilometer run, or the 1K kids’ fun run, starting at 10 a.m. at the Winthrop Rink. Cost is $5 for the 5K run or $1 for the kids’ run. Register ahead of time at Cascades Outdoor Store on Friday from 10 a.m. – 6 p.m. Race day registration will be from 9-9:45 a.m. at the rink. Parking is available at the Town Trailhead lot. Santa continues his busy schedule when he arrives on Riverside Avenue by horse-drawn wagon at around noon. From 1-4 p.m., catch a round-trip ride on a horse-drawn wagon from downtown to the Winthrop Barn and back. At the Barn, the Children’s’ Winter Fest will feature visits with Santa (including free photos sponsored by Winthrop Kiwanis), and hot dogs, chips and drinks offered for purchase by the Winthrop Auditorium Association, from 1-4 p.m.
Want to join the holiday carolers? Meet at Winthrop Town Hall at 3 p.m. There will be free hot chocolate at the visitors center. From 3 p.m. on, warm your hands at the “campfires” tended by the Methow Valley Snowmobile Association. The snowmobilers also provided the greenery decorating downtown businesses. At 5 p.m., the annual town lighting illuminates downtown with hundreds of white LED lights outlining downtown buildings. The fireworks start at 6 p.m. and typically last at least 15 minutes. Moore solicits donations from local businesses to pay for the show, which he said costs about $10,000 to put on. Winthrop’s show is unique in that it is staged by local people, not by a contracted fireworks display company, and because the fireworks are set off close to the crowd, on the bluff just west of downtown. Mohre also repeated his annual admonition to pet owners: It’s best to leave your dogs at home because the canines can be startled or frightened by the noise and bright lights. Sponsors of the event include Winthrop Ace Hardware, the Winthrop Chamber of Commerce and many other local businesses. Check the What’s Happening calendar on page A8 for more events in the valley this weekend. 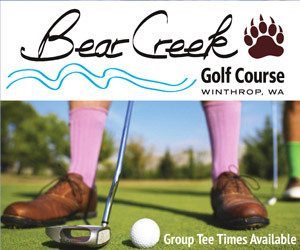 For more information, visit http://winthropwashington.com. • 2 – 4 p.m., storytelling with Granny Winthrop at Trail’s End Bookstore. • 6 – 8 p.m., skate with Santa at the Winthrop Rink (fees apply). • 10 a.m., End of the Road 5K run ($5) and 1K kids fun run ($1) starting and ending at the Winthrop Rink. Registration starts at 9 a.m.; pre-register on Friday from 10 a.m. – 6 p.m. at Cascades Outdoor Store. Proceeds benefit Cascadia Music. • Noon, Santa arrives by horse-drawn wagon on Riverside Avenue. • 1–4 p.m., Children’s Winter Fest at the Winthrop Barn, including free photos with Santa (sponsored by Winthrop Kiwanis) and food (hot chocolate, cider, cookies, hot dogs and chili) available for purchase, presented by the American Legion Auxiliary and Winthrop Auditorium Association. Free horse-drawn wagon rides between downtown and the Barn. • 3 – 5 p.m., downtown carolers, meet at Winthrop Town Hall. • 3 p.m., “campfires” tended on Riverside Avenue by the Methow Valley Snowmobile Association. • 5 p.m., town lighting ceremony. • 6 p.m., fireworks show. 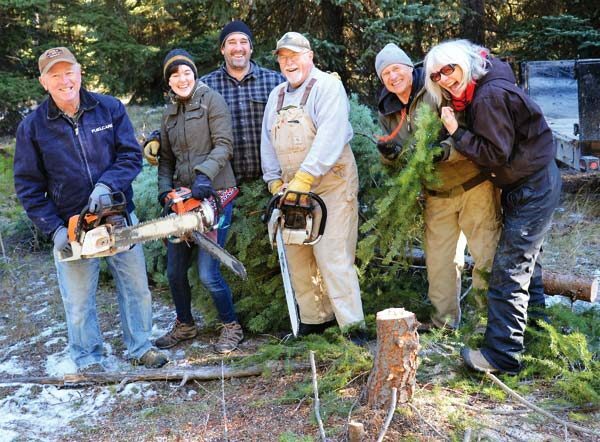 A Winthrop Kiwanis crew harvested the Christmas tree that will adorn the Winthrop Barn during the Christmas at the End of the Road’s Children’s Winter Fest on Saturday (Nov. 24).